What fun! Worked with the serger gathering foot today. After tons of practice (and scraps on the floor), now have a ruffle at the bottom of a granddaughter's summer dress. Just have to finish the rest of the dress. First though, I will work with the beading foot and add some to the top of the ruffle. Being able to gather, sew it on, and have a nice serged edge is fabulous! My gathering foot looks very similar to a ruffler I use on the sewing machine, having a lower plate that grabs the fabric for each gather. I was able to make the gather and also sew it onto my base fabric in one sewing pass. I cut about a 1.5 inch slit in my ruffle fabric. This allowed me to get the fabric all the way to the needle, making it easier to begin sewing. Slide the fabric up to the needle, aligning the edge to be gathered against the upper knife. Any fabric to be gathered goes underneath the entire foot. Place the second fabric in the slit (above the blade shown in middle photo). Lower the presser foot and begin the first stitches slowly. Having both fabrics up close to the needle prevent either from sliding. Keep both fabrics lined up with the blade as you sew. Hold both fabrics loosely as the bottom will draw up faster than the top fabric. To gather just one piece of fabric, simply place it under the gathering foot and begin sewing. I still cut my initial 1.5 inch slit and slid the fabric up to the needle. Practice with different fabrics as they can have varying fullness of gathers. Also play around with the tension. Lots of scraps to practice on! Very interesting. I just made a project with a ruffle. Basically it took three steps. First, gather the ruffle using the ruffler attachment on my sewing machine. Second, attach ruffle to the garment. Third, run garment through the serger. I can see how once you master the use of the serger attachments, it could be a real time saver. I appreciate reading all your wonderful tips! A real time saver! You can cut those ruffler steps down on your sewing machine from two steps to one step. 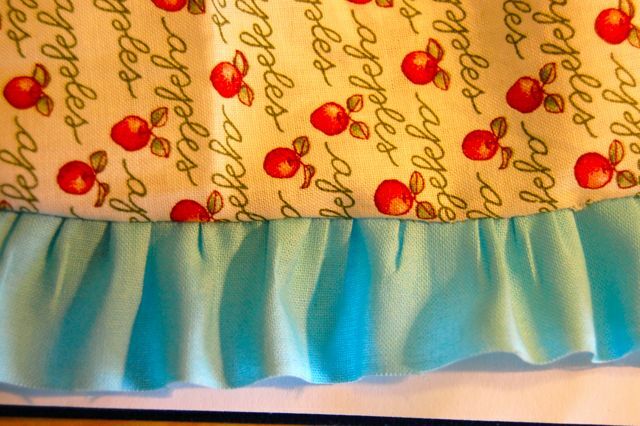 Use your ruffler to both gather/ruffle AND sew onto the base fabric at the same time. Check page 60 of my book, The Sewing Machine Attachment Handbook. Can also put a search in the blog as i have probably covered it. Another time-saver! If you put a search in google for serger gathering foot and your machine, I am sure a lot will "pop" up. I bought my serger and feet from Ken's Sew & Vac (again just google them). Nice to have a phone number and real person to talk to - should find one for your machine there. Many other places I am sure. Good luck finding one and then just have fun! HELP PLEASE! I have been practicing with the serger gathering foot ( I have a singer) and the needles miss the bottom layer altogether. If I do manage to get it to sew the bottom layer, when I open out my ruffle to the right side I have a loose "ladder" instead of a stitch. I have it set up for 4 thread mock stretch overlock. any idea what I am doing wrong? I certainly feel your pain and frustration - been there. Several things to try 1) serge slower so you can fully guide and control the bottom fabric. 2) lessen the presser on the fabric (my presser foot tension is a dial at the top), 3) try tweaking with the needle and looper tensions, stitch length, and differential feet: Try starting with stitch length of 4, differential feed of 2, right & left needle of 6, and both loopers of 5. One of your looper threads absolutly needs tweaked as sounds too loose.